Mill-Max is pleased to introduce a line of discrete, insulated spring-loaded pins. There are seven different heights of SMT spring pins to choose from assembled into a durable, high temperature Nylon 46 insulator sleeve. This new series, 807-22-001-30-00X101 (X = 0-6,) utilizes existing Mill-Max spring pins (0965 & 0900-X series) and is the first series produced by Mill-Max dedicated to be a single position insulated spring pin terminal. The 807 product is for applications where electrical isolation is required. 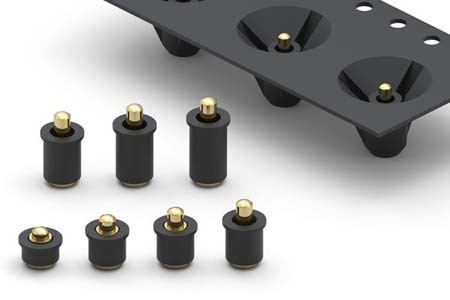 It provides insulation of the spring pin terminal for situations such as passing through a conductive case or housing, or for isolating the pin from surrounding conductive components or elements. The insulators used on the 807 series are cylindrical in shape with two diameters. The larger diameter, the collar, is .094" (2,39 mm) in diameter and acts as a positive stop as the pin passes through an enclosure. The uncompressed height range of the series is from .100" (2,54 mm) to .236" (5,99 mm) with a working travel range from .012" (,3 mm) - .0275" (,7 mm.) [Maximum stroke capability range is from .024" (,61 mm) - .055" (1,4 mm.)] See the attached data sheet for details on the height and stroke of each part. The 807 series is available in bulk or packaged on tape and reel for automated pick and place assembly; the insulator sleeve keeps the component stable in the pocket to facilitate the pick and place process. The high temperature nylon 46 insulator is suitable for RoHS soldering processes. The 807 series spring pins are constructed of precision-machined, gold-plated components and gold- plated beryllium copper springs. (The 807-22-001-30-000101 has a gold-plated stainless steel spring.) All are rated @ 2 amps and have a mechanical life of 1,000,000 cycles.